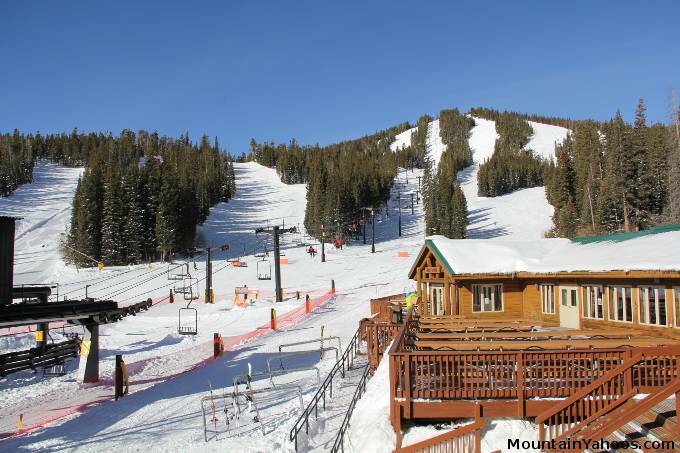 Eldora has a significant following among the Denver and Boulder Colorado residents who live close by and can avoid the automobile traffic of the main interstate, I-70. 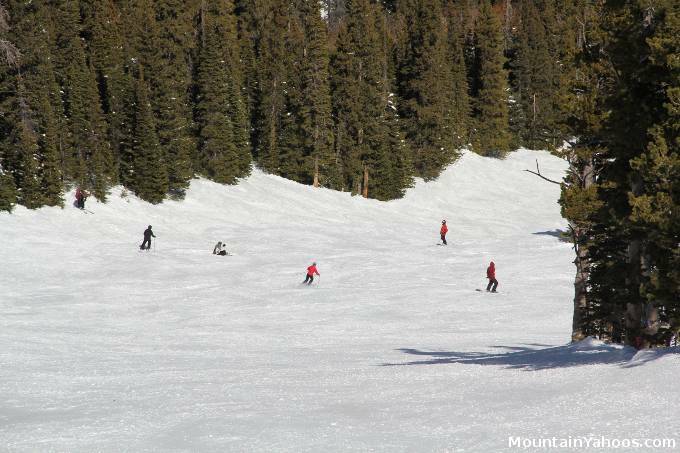 Interstate Highway 70 feeds many a skier and boarder to the primary destination resorts of Colorado and can generate a traffic scene on Friday and Sunday evenings which many would like to avoid. Eldora is only 21 miles from Boulder with regularly scheduled public transit which grants access to all. Eldora is arranged with beginner green runs on the Eastern end in Eldora's "Family Zone", with runs like "Easy Way", "Snail" and "Bunnyfair". 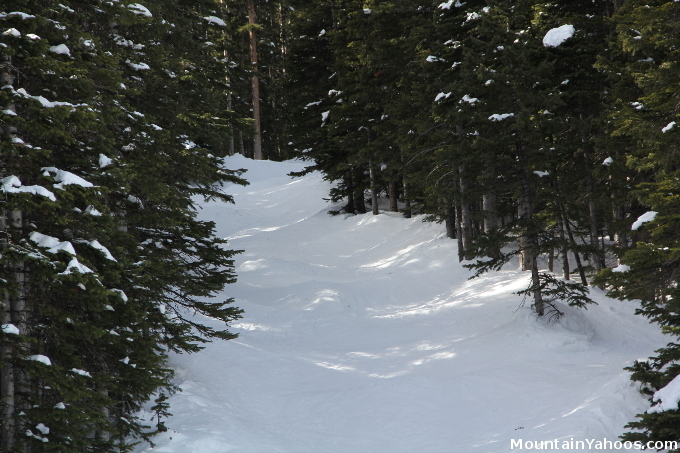 This transitions to blue and black runs in the center of the resort on "Challenge Mountain". 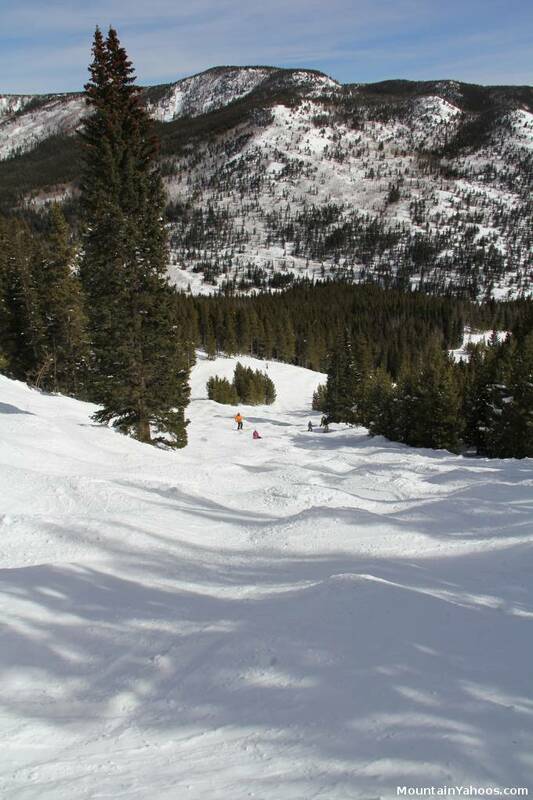 On the far right of the trail map is "Corona Bowl", occupied exclusively by black and double black diamond runs. 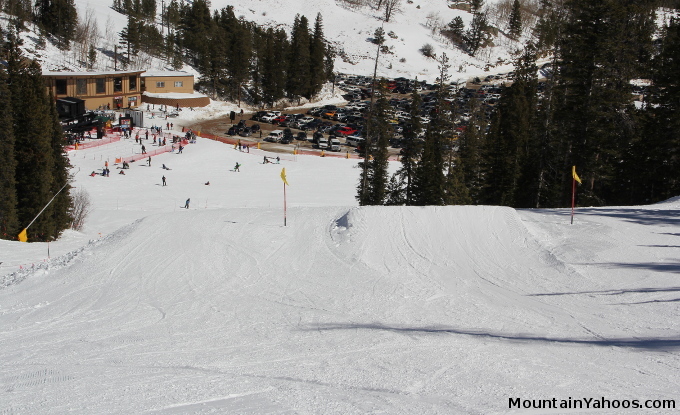 The mountain has plenty of terrain for beginners and intermediates and primarily caters to this crowd. Blue cruiser "Around the Horn"
The chair lifts Challenger and Cannonball are available from the base of the mountain and can take you to the majority of the blue runs. 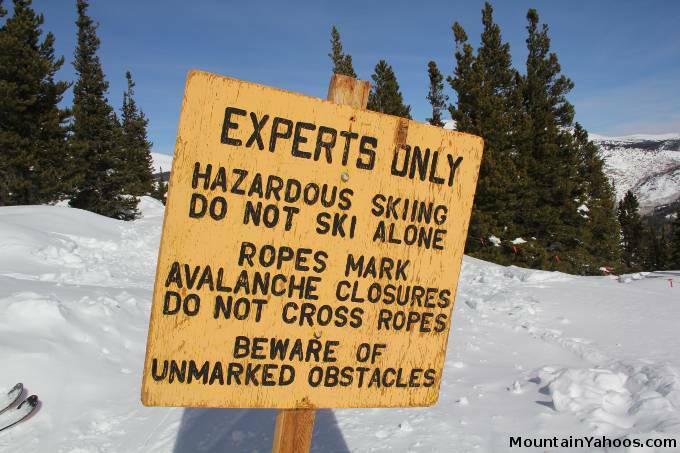 Intermediate skiers will get to know these two lifts well. 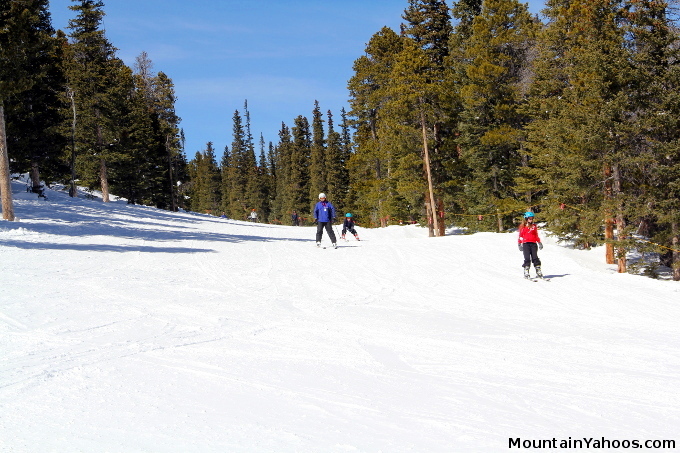 The most advanced areas of the mountain are accessible from "Indian Peaks" and "Corona" chair lifts. 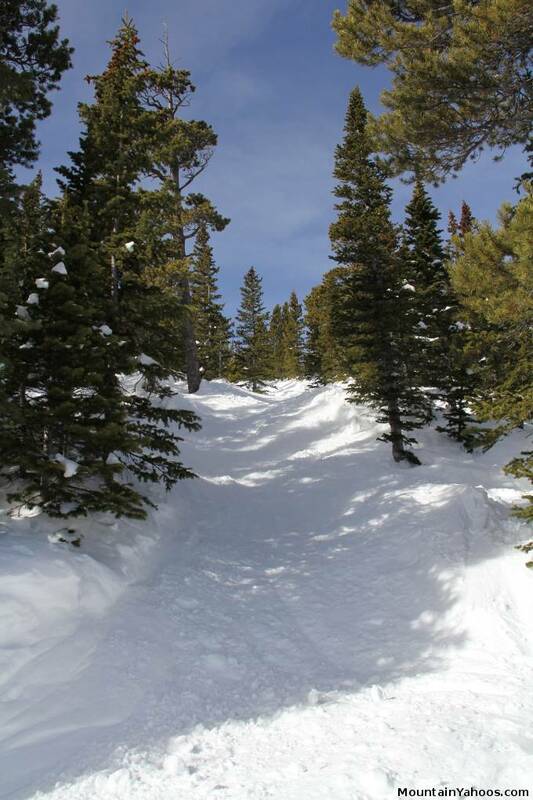 There are plenty of glades and moguls to test your skills. 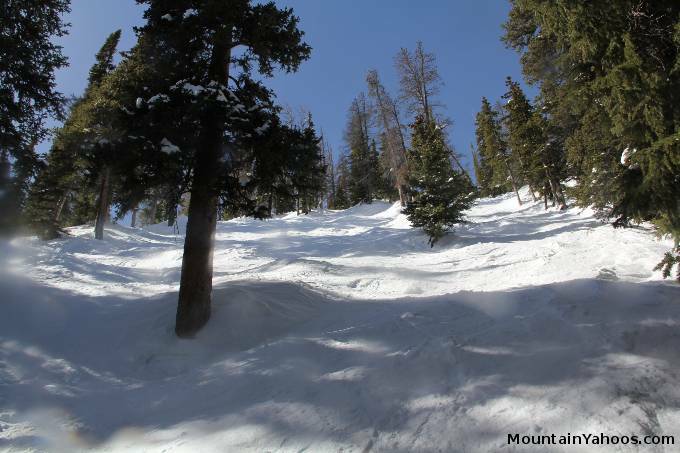 Eldora has an abundance of widely spaced, yet advanced, tree runs. 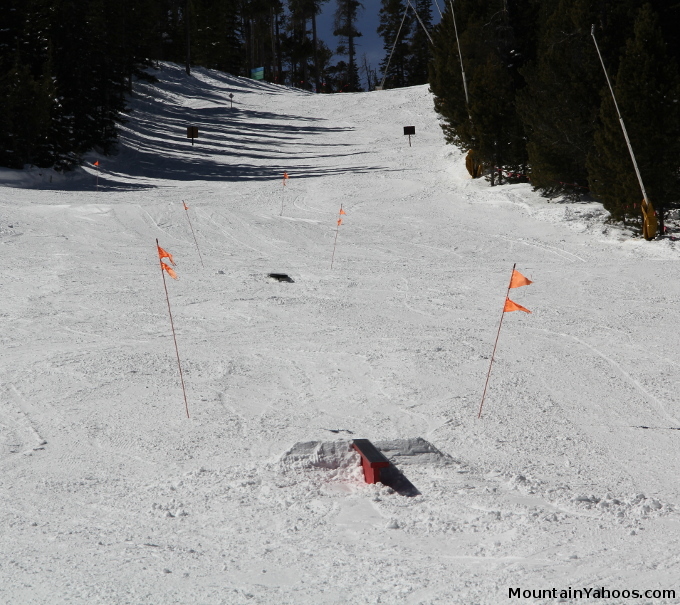 As shown here, the terrain park features are not why people come here. One will find that the Eldora mountain base has the basic necessities for the day. 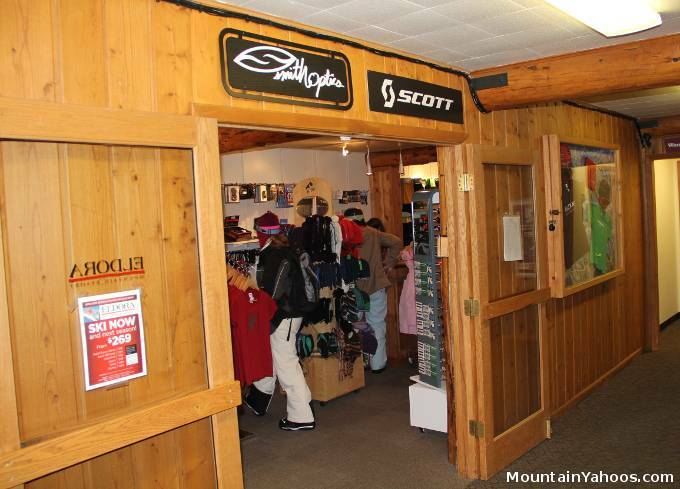 Store in Timbers Lodge at base: apparel, accessories and souvenirs.